This is the second part in a brief series of posts looking at Lawrence Solum’s normative arguments for originalism. Originalism is a theory of constitutional interpretation which holds that a written constitution (could be any, but the US constitution usually) ought to be interpreted in accordance with the semantic content that its clauses had at the time of ratification. Roughly speaking, there are two ways in which to cash out what that semantic content is: (i) intentionalism, which holds that the content is fixed by the intentions of the framers; and (ii) conventionalism, which holds that the content is fixed by the public meaning of the clauses at the time of ratification. In an earlier post, I outlined some of Solum’s arguments in favour conventionalism. 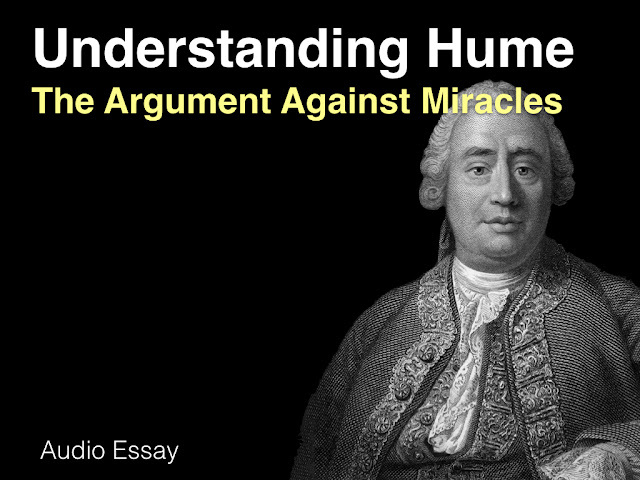 In this two-part series, I’m changing tack and looking at Solum’s normative arguments in favour of originalism. The arguments are taken from the book Constitutional Originalism. These normative arguments play a crucial role in the debate over originalism. After all, even if Solum and other originalists are correct in saying that the semantic content of the constitution really is fixed at the time of ratification, it does not follow that judges and other officials ought to respect it. There may be moral reasons for overruling or occasionally disregarding it; for changing and amending it; or for tearing it up and drafting a new one. In part one, we looked at one normative argument in favour of originalism: the argument from popular sovereignty. As we saw, there are a number of problems with this argument, at least in the form adopted by Solum. Today we’ll look at another argument, one that happens to feature quite prominently in the debate about originalism: the rule of law argument. According to this argument, originalism can be endorsed thanks to the positive role it plays in promoting the rule of law. To flesh out this argument, we’ll first need to consider the virtues of the rule of law. Then, we’ll need to explain how originalism contributes to it. Finally, we’ll need address the criticisms of the rule of law argument. It’s almost a cliche to say this, but here goes: the rule of law is a somewhat elusive concept. The basic idea is readily stated: people should be governed by laws, not by arbitrary exercises of power. To put it another way, and to quote from John Adams, there should be a “government of laws, not of men”. That’s not to say there won’t be men (and, of course, women) doing the governing, it’s that they will not be above the law. They, like everyone else, will be subject to it and accountable under it. That much is straightforward. The devil is in the details. That is, in precise mechanisms through which this preferred state of governance is to be realised. Some complain that the “rule of law” is an empty piece of rhetoric, a placeholder for all the positive aspects of a political system. But this isn’t entirely fair. There is some reasonable guidance out there. For instance, the American legal philosopher Lon Fuller famously identified eight features of good law-making. Among these features were publicity, prospectivity, certainty, and consistency. These contributed, in his words, to the “inner morality of the law”, which is presumably what the rule of law consists in. More recently, the English jurist, Lord Justice Bingham, identified another set of eight principles — among them, again, accessibility and predictability, but also lack of discretion, equality and basic humans rights protection — which he felt constituted the rule of law. Fuller and Bingham seem, by my lights, to be on the right track. Ignoring the mechanisms for the moment, let’s turn to the moral question: why should we prefer the rule of law? On the face of it, there doesn’t appear to be any necessary connection between the rule of law and the morally preferred state of existence. It is surely possible for there to be a benevolent dictatorship or a wicked set of accessible, predictable and consistent laws? Maybe; maybe not. There are some who argue that the kinds of principles identified by Fuller and Bingham have intrinsic value, a value that dictatorial or arbitrary system of governance will obviously lack, but there are also those who will argue that the rule of law has instrumental value, either because it does (or is more likely to) lead to better kinds of outcome. I can’t say exactly where I come out on all of this. I certainly think a “government of laws” is a better bet than “government of men” (going by my cursory sweep over the historical evidence). But I’m not sure why or what its precise constituents might be. Fortunately, I need neither of these things right now. For the purposes of this post, I will simply assume that the rule of law is morally desirable and that predictability, certainty, prospectivity and avoidance of discretion are part of the picture. Solum, I should add, seems to agree. 2. The Rule of Law Argument: What’s Originalism got to do with it? With this theoretical background in place, the rule of law argument can be developed. The essence of the argument is twofold: (i) that an originalist method of interpretation can contribute to the rule of law; and (ii) that it does so better than other approaches to judicial decision-making. The first part of the argument is reasonable enough, but the second part is much trickier and also crucial to its overall success. (7) We ought to protect and sustain the rule of law. (8) Originalist interpretation of the constitution helps to protect and sustain the rule of law. (9) No other theory of judicial decision-making does a better job of protecting and sustaining the rule of law. (10) Therefore, we ought to adopt an originalist approach to the interpretation of the law. Now let’s get bogged down in the details. By which, of course, I mean the defence of each of the key premises. We’ve already looked at premise (7), so we’ll leave it to the side and focus on (8) and (9) instead (don’t worry we’ll be getting back to (7) when we look at criticisms of the argument as a whole). Premise (8) is defended by the appeal to the rule of law virtues of predictability, certainty and non-arbitrariness. As stated above, what distinguishes the rule of law from, say, the rule of force is that everyone is subject to and accountable under the law and that no one individual has the power to change those laws at a whim. For this to work, we have to make sure that the laws are sufficiently stable and well-understood so that people can order their lives in relation to them, and that they are sufficiently constraining so that no one can alter or undermine them with ease. Solum, along with other originalists, argues that this is only possible when the laws have a stable core of fixed meaning. And, further, that this is only possible if we adopt an originalist approach to interpretation. (11) If an approach to judicial decision-making provides predictability, certainty and non-arbitrariness, then it protects and sustains the rule of law. (12) Originalist interpretation of the constitution provides predictability, certainty and non-arbitrariness (by constraining judges and officials within the boundaries of a fixed original meaning). (8) Therefore, originalist interpretation of the constitution helps to protect and sustain the rule of law. We shan’t say anything critical about this argument at this juncture. We’ll postpone that ’til the next section. We move on instead to the defence of premise (9). As I said, this is crucial to the overall argument: it’s not good enough to say that originalism protects the rule of law, it must be shown that it does a better job of this than alternative theories of judicial decision-making. Can an argument be made to that effect? (13) If an approach to judicial decision-making allows for some flexibility and discretion, it implies that such decisions will (potentially) lack predictability and certainty (which are needed in order to sustain the rule of law). 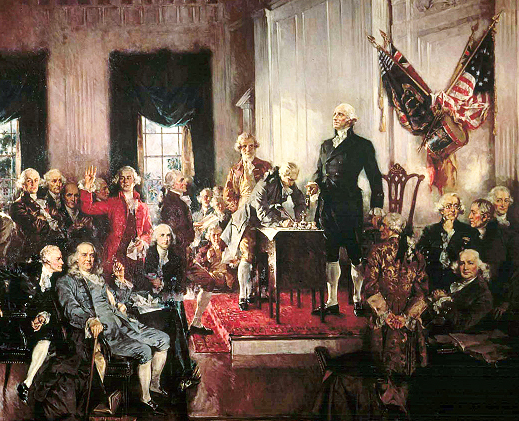 (14) Leading alternatives to originalism (living constitutionalism etc.) allow for greater flexibility and discretion than originalism. (15) Therefore, leading alternatives to originalism will create a greater potential for unpredictability and uncertainty than originalism (which is damaging to the rule of law). As can be seen, this argument isn’t yet a defence of premise (9). There are a couple of reasons for this. The most important one for now is that the argument says nothing about the arbitrariness of the decisions under the alternatives to originalism. As you recall, “arbitrariness” was also part of the rule of law virtues that originalism was supposed to protect. Why doesn’t the argument say anything about this? The answer lies in the nature of an “arbitrary” decision. To my mind, non-arbitrariness doesn’t simply equate with predictability. If it did there would be no reason to include it as a separate component in the rule of law. Instead, non-arbitrariness suggests a decision that is grounded in sound moral principle, that is not simply an exercise in vindictiveness, whimsy or caprice. And this is where the defenders of the alternatives to originalism may gain some ground. Presumably such advocates don’t defend their theories because they are lovers of unpredictability and uncertainty; presumably, they do so because they think there is something morally superior to them. In particular, they might be inclined to argue that affording judges greater flexibility in their decision-making allows them to make decisions that avoid the moral mistakes of the past and are more attuned to the moral needs of the present. But in that case the decisions would be guided by moral principle and would thus be non-arbitrary. Originalists will need some sort of response to this. Have they got one? Solum makes a few gestures in the right direction (pg. 41) by claiming that once we grant judges the power to overrule/amend the constitution they will exert that power in a political and legal vacuum. In other words, they will stand above the law - free to change it as they see fit - a situation we sought to avoid by promoting the rule of law. And while that won’t necessarily lead to problems, it increases the changes that problems will arise. We can well imagine what might happen: with the power vacuum opened up, politicians will seek to appoint ideologically driven judges and there’s no reason why these judges would have to adhere to a morally commendable ideological cause. That is to say, if we allow for discretion, we create the conditions in which arbitrary decision-making can flourish, even if we don’t necessitate that outcome. (16) If judges are given the freedom to amend or overrule the constitution, this will create the conditions in which the arbitrary exercise of power can flourish (which would be contrary to the rule of law). (17) The leading alternatives to originalism would allow judges the freedom to amend or overrule the constitution; originalism would not, or, at least, would do so to a lesser degree. (18) Therefore, leading alternatives originalism would be more likely create the conditions in which the arbitrary exercise of power can flourish. When you combine (18) and (15) you get a defence of premise (9). The rule of law argument is then complete. 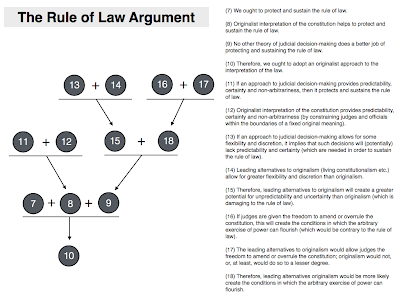 This is a rather complex argument, so it might behoove us to consolidate the chain of reasoning into an argument map. I held off on criticism in previous section. Now it’s time to correct for that omission. As I see it, there are two types of criticism one can make of the rule of law argument. The first focuses initially on premise (7), but then has downstream effects on premise (9). The second follows a similar pattern only it starts off with premise (8). I’ll briefly outline both types of criticism here. I will not have the time to develop them in any detail, but I’ll lay the foundations at least. (7*) We ought to protect and sustain the rule of law, provided that the law is not unjust. Modifying the premise in this manner creates a number of problems. One of these is that it opens up a chink through which the non-originalist theories — banished by premise (9) — can creep back in. Proponents of those theories will argue that if a constitution does contain an original injustice, there is good reason to adopt an alternative to originalism, and to allow judges (and other officials) to correct for that injustice. Of course, this line of attack won’t always work — it all depends on whether the constitution contains an original injustice — but it does highlight the fact that fidelity to the law is only justified if certain preconditions are met. How might an originalist respond? They will typically suggest that there is an alternative and better solution to the problem of original injustice: amend the constitution by plebiscite, not judicial opinion. Solum puts it this way: if you were to select, from behind a veil of ignorance, a procedure for amending the constitution, would that procedure grant final authority to a small number of judges or to the people en masse? The question has some rhetorical force, no doubt. I should also note that amendment by popular vote is quite common in many countries (certainly in my home country) and works quite successfully. Ironically, this does not seem to be true in the US. Mainly this is because amendment is more difficult there, but it could partly (as some have argued) be because judicial activism has drawn attention away from that possibility. We turn now to the second type of criticism. This one focuses its ire on premise (8) which, as you’ll recall, stated that originalism did help to protect and sustain the rule of law. The criticism suggests that it does no such thing. To appreciate the criticism we need to refresh our memories about the broader defence of premise (8) which was outlined above. This defence specified that the protection of the rule of law was achieved by constraining decision-makers within the boundaries of original meaning and thereby helping to promote predictability, certainty and non-arbitrariness. But is that actually true? There are those who argue that the constraining powers of originalism are greatly exaggerated. That even if we do try to stick to the original meaning, there will be plenty of room for discretion and flexibility. The US Supreme Court decision in Heller is often thought to illustrate this: both sides focused on the historical meaning of the 2nd Amendment but both reached remarkably different conclusions. There is much that could be said about this claim, and this example, but I want to sidestep all that and make a more general point. This point links directly into premise (9). I begin with this observation: even if originalism did contribute to predictability, certainty and non-arbitrariness, there doesn’t appear to be anything unique about originalism in terms of its power to do this. Judicial philosophies and ideologies will nearly always constrain judges in ways that make their rulings predictable and could thereby provide legal certainty. For example, Justice William O. Douglas was one of the more notorious “liberals” on the US Supreme Court in the mid-20th century. He famously purported to find rights hidden in the “emanations” and “penumbras” of constitutional clauses. But for all that, there was nothing very unpredictable about his decision-making: he followed a very clear and obvious ideology in his decision-making. One nearly always knew where he would come out on a controversial issue. This was true of other famous justices too, even when they didn’t follow an originalist approach. The point is this: originalism doesn’t win the normative battle simply because it provides predictability and certainty. Most judicial theories and philosophies will do this. If originalism is to win, it will have to be on independent normative grounds. And as we saw the last day when investigating the argument from popular sovereignty, at least one of those independent grounds is not up to the job. That brings us to the end of this series. 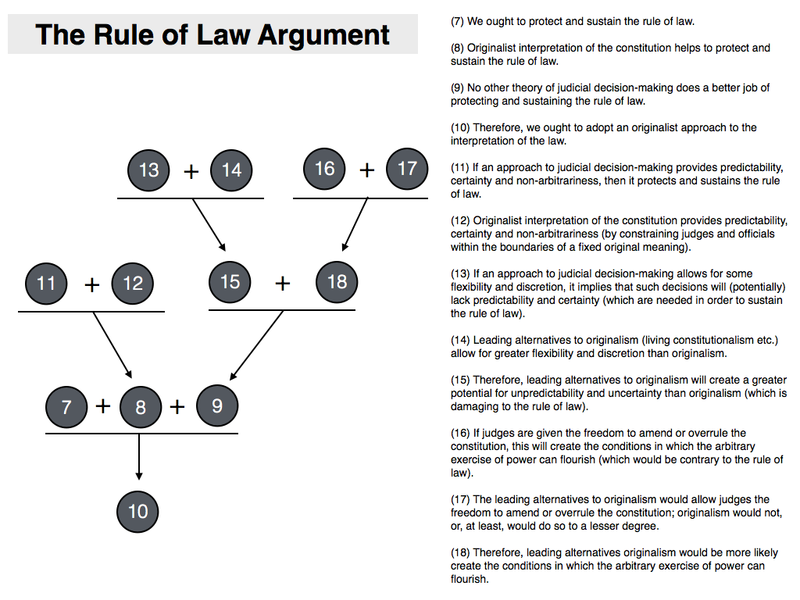 As we saw in this post, one common defence of originalism holds that it both: (a) manages to protect and sustain the rule of law and (b) does so better than alternative theories of judicial decision-making. This is because it constrains judicial decision-making in such a way that promotes the rule of law virtues of predictability, certainty and non-arbitrariness. However, as we saw in the previous section, this defence of originalism is open to at least two criticisms. The first is that the rule of law ought only to be promoted if certain preconditions are met. The second is that the constraining powers of originalism — at least when contrasted with other approaches to judicial decision-making — are exaggerated.